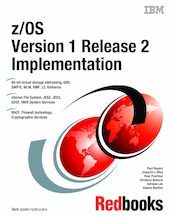 This IBM Redbooks publication highlights many new enhancements made in z/OS Version 1 Release 2. You can use this information to help you install, tailor, and configure z/OS Version 1 Release 2. It will give you an understanding of a new architecture for 64-bit virtual storage addressing. Other topics discussed are the enhancements to z/OS base control program (BCP) elements; z/OS JES2 Version 1 Release 2, a new zSeries File System, Spool Display and Search Facility (SDSF), UNIX System Services, SMP/E, Workload Manager, RMF, z/OS JES3 Version 1 Release 2, and Language Environment. This book also describes several SecureWay Security Server functional enhancements to RACF, Firewall technology, z/OS cryptographic services, and Security Server Kerberos. It is intended for system programmers and administrators responsible for customizing and installing z/OS.